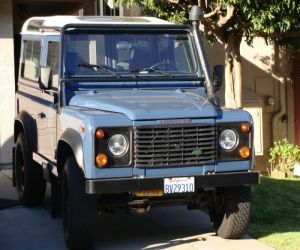 This 1997 Land Rover Defender TDI has 2,500 miles on it going from the time that it has been redone. This land rover is selling for $95,000. The engine and transmission is now a factory 300Tdi package. The exhaust system is stainless steel and is an APR unit. This has a galvanized, steel frame. The whole entire body of the car was redone and repainted as well. They painted it a blue color. Inside this fully redone vehicle you will find a kick panel that is footwell. There is a headliner that is a Badger Coachworks. The previous owner has put an am/fm ipod music system in the center locking console. The doors have a no burst locking system. So you do not have to worry about some one trying to break in or vandalize your new investment there is an anti theft alarm that was installed. Even the dashboard has had an upgrade to a 300Tdi, this has a diesel engine gauge along with switch controls. For those sweltering hot days that you want to go on a car ride they have also placed in an air conditioning unit. This 97 Land rover has an old man emu suspension package on it. The axles are Very strong and they are ERC. The brake lines are made from all steel. The calipers and rotors and new as well. So you have a safe and good drive the wheels of this car are steel and wolf style, with BF Goodrich tires on them. The guards for the fuel tank are made from aluminum. To the rear of this vehicle a new door was placed on it, which is steel and has a spot for the spare tire to sit in.